A Northumberland entrepreneur’s simple application of technology to improve safety within the oil, gas and power industries is set to go global after winning support from the new North East Small Loan Fund Supported By The European Regional Development Fund. Jon Naylor has more than 30 years’ experience of working in senior positions within the industrial pipelines sector and provides high level strategic consultancy to clients around the world through his Bedlington-based firm, JNCS Business Services Ltd.
Jon realised that there was an industry need to improve the processes around the closure of the dozens of flange pieces that join sections of pipeline to each other, which is done by engineers in a precise order to ensure the connections are made as they should be and that potential safety issues are properly managed. In response, he developed the TorqTag®, a small magnetic device that temporarily attaches to each bolt, helping technicians keep track of their bolting sequence. With the addition of a unique barcode on each TorqTag®, they can be used in conjunction with electronic data collection devices which are becoming widely used across the industrial bolting sector. 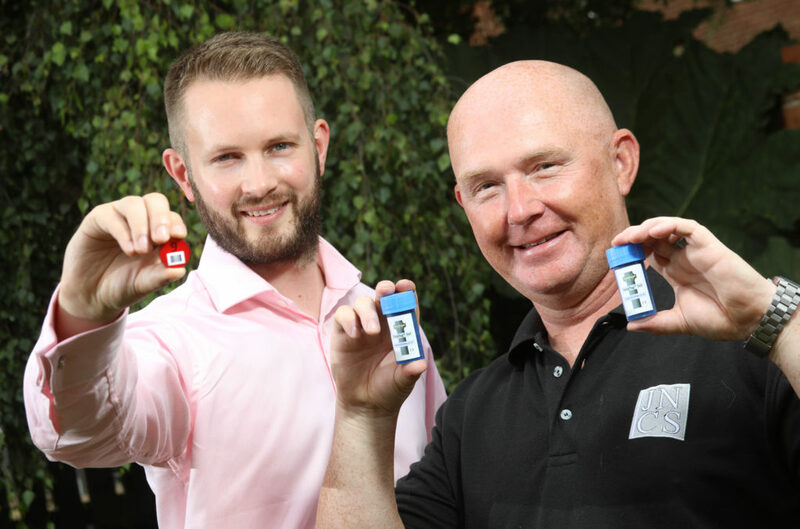 Having already won orders from existing and new clients around the world, Jon has worked with regional fund management firm NEL Fund Managers to secure a £10,000 Small Loan Fund investment that is helping improve the manufacturing processes around the TorqTag. Cramlington-based Algernon Precision Engineering are helping JNCS Business Services Ltd develop a new machine that enables sets of 28 TorqTags to be made in just a few seconds, which will allow for orders to be fulfilled far more quickly than is currently possible. The firm has access to the worldwide distribution network of one of its existing clients, Torq-Comm, which manufacture electronic data collection devices, while sales opportunities are also being progressed in South East Asia, the US and Brazil. Jon Naylor says: “These bolts have to be tightened in a certain order, just like you tighten opposite nuts on a car wheel to prevent it from becoming unbalanced, and with dozens of bolts on each pipeline, it can be hard to keep track of what has and hasn’t been done. “The TorqTag® means users know precisely which bolts have been tightened, removing any doubt from the process and ensuring that engineers don’t have to resort to chalk marks and other low-tech methods they’ve previously used to keep these tasks on track. “Rising demand and interest in the product has created a need to speed up the manufacturing process, and the machine that’s been designed and built here in Northumberland will make a significant difference to the number of orders we can fulfil. “We know there’s a real gap in the market for this product on projects right around the world and believe that it’s likely we’ll need to invest in further machines in the future as demand rises even further.